Do you think you are doing a good job of sticking to your healthy diet? You might be. But chances are good that you are eating too much of certain foods. Almost everyone makes portion size mistakes, especially when they are trying to lose weight. These are the foods that most of us overeat. Scan this list of commonly eaten foods. It's likely that you are overindulging in at least one of them. Remember, even healthy foods can derail your diet if you eat too much of them. When is the last time you measured your cereal before pouring it into a bowl? Have you ever checked the Nutrition Facts label to determine the correct serving size? For some cereals, one cup is the recommended serving size. But the American Diabetes Association lists ¾ cup as a suggested serving. If you pour your cereal straight into the bowl, chances are good you are eating up to two servings. And if you refill the bowl (as most of us do) you may be eating 3-4 servings. Lean protein is healthy, right? Not if you eat too much of it. If you are eating a whole chicken breast for dinner, you might be eating too much. The recommended single portion of chicken is 3-4 ounces, about the size of a deck of playing cards. Some people use the palm of their hand as a guide. Depending on the vendor, some chicken breasts are twice or even three times the size of a recommended serving. The calories in chicken breast can add up and ruin your diet. If you are counting your hamburger patty as one serving of beef, you are probably underestimating the calories you've consumed. A quarter pound burger (four ounces) is slightly larger than the recommended serving size of three ounces. But many burgers, especially those served at restaurants, are 1/3 to 1/2 pound. You might be eating twice as many calories as you think you are. Your morning cup of java might be the most fattening—and unhealthy—thing you consume all day if you add flavored creamer. And you're not off the hook if you use the fat-free variety. A single serving of liquid creamer is one tablespoon. Do you pull out the measuring spoons when you add cream to your coffee? Probably not. If you are drinking more than the recommended serving (remember to count each cup of coffee!) then the small amount of fat in the "fat-free" creamer starts to add up quickly. You might skip the oil or butter when you cook healthy meals at home. This is good! But you might be neglecting to account for the calories in your cooking spray. If you use PAM to avoid adding calories to your food you might want to know that a single serving of the spray is 1/4 of one second. Do you keep a stopwatch in your kitchen? It's not likely that you do. The Center for Science in the Public Interest evaluated the spray and reported that a more typical six-second spray would have 50 calories and 6 grams of fat. If you pack yourself a healthy lunch with a lean meat sandwich, congratulations! You are probably saving yourself from the belly-busting caloriefest that you'd experience if you went to a restaurant. But did you accurately record the calories in your whole grain bread? If you think your sandwich equals one serving, think again. For many bread products, a single serving is only one slice of bread. Perhaps consider a bread swap. A healthy serving of fresh fruit is a great alternative to a high-fat dessert. But if you are counting your calories or watching your sugar intake you need to monitor how much you are eating. Take grapes for example. If you sit down with a bowl of grapes, you might add one serving of grapes to your food diary. Wrong! A single (cup) serving of grapes is only 16 grapes. Get out your calculator before you start chomping. Sugary drinks are one of the easiest things to overconsume. We often put them next to us and mindlessly sip away. But the calories in soda add up, even if you only drink one a day! And for many reasons, diet soda is not a good alternative. A serving size of Coke is 12 ounces. But most of us drink plenty more than that when we fill up at the soda fountain. A 7-11 Double Gulp contains 50 ounces and 575 calories. A healthy salad is a great alternative to a high starch, high-fat meal. But the salad dressing can add calories that could make any prudent calorie counter blush. By some estimates, many restaurant salads contain over 500 calories, most often due to the fatty dressing. A serving size of salad dressing is just two tablespoons. If you order your dressing on the side, your waiter will probably bring you much more than that and it you're like many restaurant diners, you pour all of it on your salad. 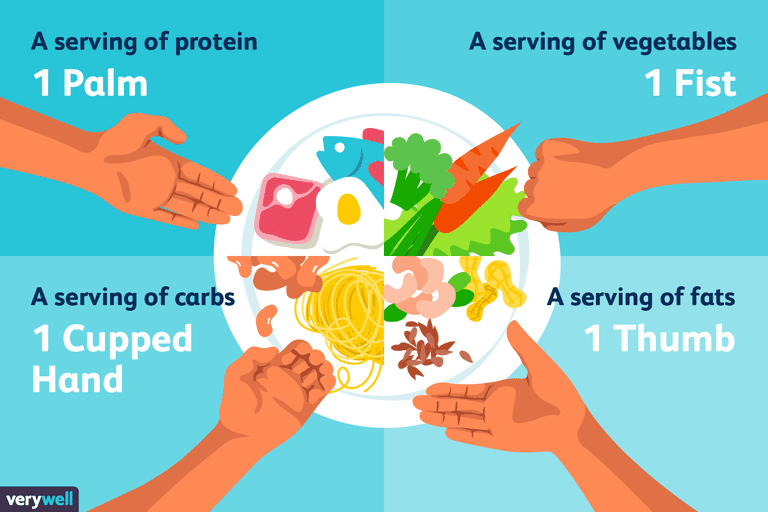 No matter what kind of food you are eating, portion size matters. Even if you are eating a "healthy" food, you should be mindful of the amount that you consume. But you may not be able to use the Nutrition Facts label as a guide. This is a common blunder made many smart dieters. The serving size listed on the label is not the recommended portion size. It is simply the amount that most people consume when they sit down to eat that particular food. It might also be the amount of food listed in your automated food log or diet app. The best way to manage portion control is to measure your foods with inexpensive kitchen tools like a measuring cup, measuring spoons or (my favorite) a digital scale. You can also measure foods without a scale, but calibrated tools are more accurate. Then keep a quick quide to the correct portion sizes for weight loss posted nearby as a reference. Then record the foods accurately with a calorie counting app. Most of the apps and websites allow you to customize your portion when you add each food. You may be surprised how just measuring your food makes a big difference in your food intake and probably in the way your clothes fit. Center for Science in the Public Interest. "Unrealistic Serving Sizes Understate Calories, Sodium, Saturated Fat, Says CSPI." August 2, 2011.